Mid-Life Cruising!!! : Sailing to Mexico! Mexican sunrise from our v-berth hatch! After a few days in Key West, the time had come to pull up the anchor .. our sailing adventure was about to begin! 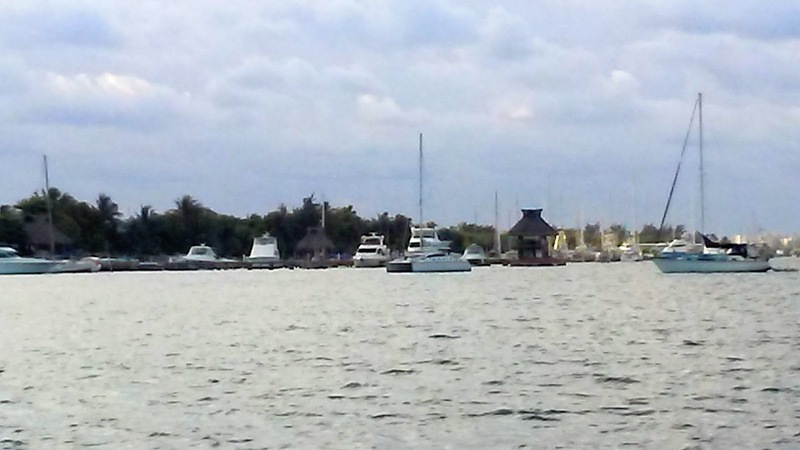 For those that missed my last post .. here's a photo of the Hylas 47 anchored in Mexico. We sailed on this with our friend & owner of the boat, Charlie. It's a beautiful boat, and we loved the way it sailed! While enjoying the views & conversation in the cockpit, we took turns watching out for crab pots. I swear these things were everywhere for that entire first day! Grabbing one of these pots on the prop was something we wanted to avoid, and luckily we did. Ken found his spot outside of the cockpit to watch for pots ... look how blue that water is! As night drew near, we settled on 3-hour shifts between the three of us. I drew up the schedule and tried to mentally prepare myself for my first overnight shift later that night. Our friend & owner of the boat, Charlie, eased our minds with his laid back attitude. As night appeared, Ken & I expected to get nervous about not being able to see around us. Surprisingly, neither of us freaked out and we were both more excited about our first night's passage than anything else. When my 1:00 am shift arrived that Saturday night, I was ready to put what I had learned to the test. 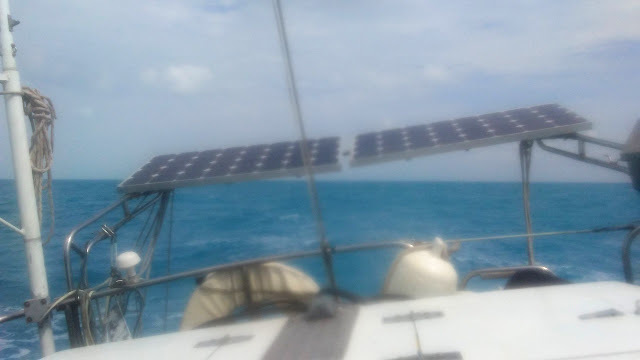 Basically, I kept an eye on the AIS for ships in our path and made sure that the auto-pilot was on the proper course. Charlie slept in the cockpit in case I needed to wake him for anything, and Ken also slept in the cockpit for moral support on my first watch. While I wasn't nervous, it was nice to know that I wasn't truly alone. I passed the time by checking out the ships on the AIS .. most were over 600 feet in length & headed to Cozumel or other areas nearby. It was pretty cool to learn the names of these ships, their length, and their destination. Even more interesting was learning at what time we'd be at our closest point to these floating giants. It was reassuring to know that we weren't on a collision course! It was amazing to see a ship show up miles away on the AIS, then see tiny lights on the horizon. When being in the dark, those lights show up a long ways away. With that in mind, I scanned the horizon about every 20-30 minutes for signs of lights from boats that may not show up on the AIS. The big ships are required to use AIS, but sailboats & smaller boats aren't required to use this. Therefore, a scan over the horizon is a good idea if you wanna make sure you don't hit a boat! I also spent my 3 hour shift gazing at the incredible light show in the sky! While I've seen my share of starry nights in the country as a child, I swear I'd never seen so many stars in the sky than I did during my night watches. The sky was littered with tiny stars and a crescent moon, which reflected on the dark waters .. it was truly magical. I tried to embrace this time and cement it in my memory. There isn't anything better than simply being one-on-one with nature's beauty. Before I knew it, my first night shift was over and it was time for Ken to take over. Since it was his first shift, I stayed up with him a while and we both enjoyed the night sky and this memorable time together. We did it! We finally sailed overnight, and we survived! The following day was beautiful, and we no longer had to watch for crab pots. While sitting in the cockpit, out of the blue (literally) came a school of flying fish! Ken & I had never seen these before, and they were really cool to watch as they flew over the water for about 7-8 seconds. They flew like tiny jets and would brush the waves like a rock skims the water. Then, as suddenly as they appeared, they were gone. We saw this happen a couple of times later that day and the next .. really amazing to see. We also enjoyed another visit from a pod of dolphin. These were tiny little guys, and they swam & played with our bow for at least 15 minutes! Some even jumped as high out of the water as they could, then belly-flopped into the water. They seemed to be having a blast! I couldn't seem to get my short video to post here, but you can find it on our Facebook page here. When hearing of sailing for 3 days, one may think of hanging out on the bow of the boat, soaking up the sun and taking tons of photos .. at least that's what I imagined. But, the truth is that I love my sleep so a series of 3-hour shifts over three days is exhausting! I didn't pick up my camera much, because I was too lazy. I also was overdue for a shower, which didn't help me get motivated. I decided to just live in the moment, and go with the flow. The second night's watch was also uneventful .. and beautiful. While I wasn't able to see the lights of Cuba on our port side, I was able to see the "forbidden" country for over a day on the GPS. It seemed to take forever to pass Cuba, as we were also fighting the current of the Gulf Steam. I daydreamed about taking our own boat to Cuba on the way to Mexico someday. When Ken relieved me of my shift, I went down below to sleep in the v-berth. It was quite a difference sleeping in the v-berth while fighting the Gulf Stream! The sound of the current against the bow of the boat with such force was quite impressive. While it was hard to sleep with such loud (almost violent sounds), I was glad I had gone down below and experienced it. Our third & final day at sea was a bit "sporty" as Charlie would say. There was a Northerly sweeping around us to our starboard side, and the skies got pretty dark. We encountered a short period of rain that afternoon, but nothing too bad. Of course, it's not so bad when it's not my shift and the guys insist I go downstairs. My arm didn't have to be twisted, and I stayed down below for about 20 minutes until the rain passed. With the Northerly that day, the waves increased a good bit and we were also fighting the Gulf Stream. That 3rd night, we were in winds up to 25 knots and in what felt like huge waves. We were rolling a good bit, and going down below was a real challenge. I felt like a ball inside of a pinball machine when down there! Luckily, none of us got seasick. Charlie said that it was probably a good thing we couldn't see the waves .. I have a feeling he was right! We motor-sailed throughout the night, and although we were only moving about 4 knots against the current, we were actually doing about 8 knots. While on my night watch, we seemed to be flying! I pushed back thoughts of the engine dying or hitting something, and instead enjoyed the exhilarating feeling of cutting through the waves. 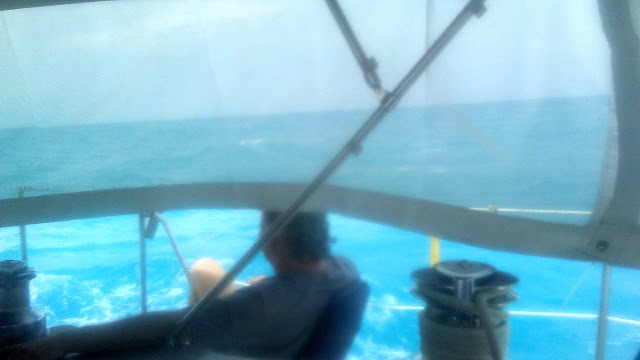 It kinda felt like riding a galloping horse, and while I wouldn't want to be in those conditions on our smaller boat .. I got a thrill out of that boat moving through the waves with such force. 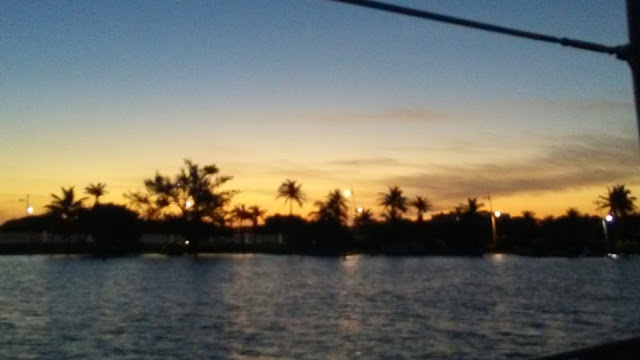 Before Ken's shift was over and the sun rose, Ken was able to see the lights of Isla Mujeres. We've always heard not to enter an unfamiliar port in the dark, and it wasn't our boat, so Ken woke up Charlie. I was already awake, as I couldn't get much sleep rocking around down below. A decision was made to kill some time until the sun rose, then we made our way into the anchorage of Isla Mujeres. You'd think that the three of us would be celebrating the fact that we'd arrived in Isla Mujeres. As I mentioned earlier, we didn't get a lot of sleep and were too tired to do any celebrating. 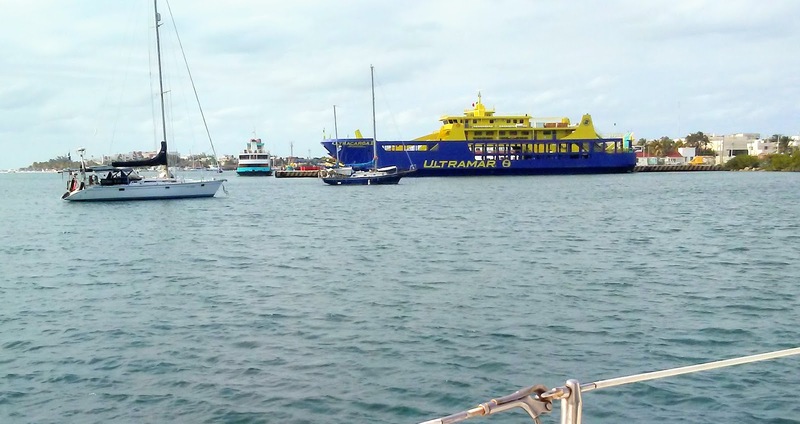 It was a cloudy day when we arrived, and after anchoring Charlie raised the yellow quarantine flag to show that we hadn't yet checked into the country. Then, we all crashed! We didn't leave the boat that day. We ate a good meal of chicken & rice, and kinda just hung out in the cockpit. 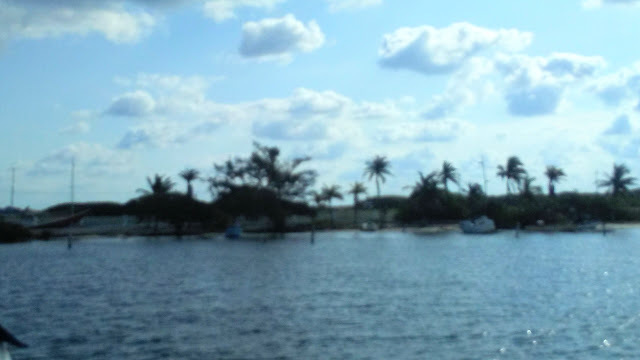 We had the ferry dock and "downtown" (North) on one side of us ..
and the lagoon on the other side. The tiny beach nearby turned out to be a really convenient place to dock the dinghy! (I hate my new phone's camera .. sorry for the blurry images)! The following day we started the "check-in" process to Mexico. This is a rather time-consuming process, but not as complicated as it originally sounds. It took us two days to check in, and we did not pay the $75 to hire an agent. I'll wrote a detailed post about the process soon. So, we've finally sailed overnight .. and have even done a 3-day passage to a foreign country! We're so glad that we took this opportunity, and had a great experience. We still have a lot to learn, but this gave us a really good idea of what an overnight sail is like, and how to use the latest navigation electronics. We definitely are sold on getting an AIS! We also learned about anchoring, and staying out of the swing of other boats! Was that boat dragging?! After Ken & Charlie watched it a while .. yes, it was. A friendly chat with the neighbor and a collision was avoided. Me and our friend who made all of this possible .. Charlie! We are so grateful to have met him at our marina last year. He was really patient, and put up with us on his boat for two weeks! This passage has made us motivated to get Nirvana ready for cruising this year! 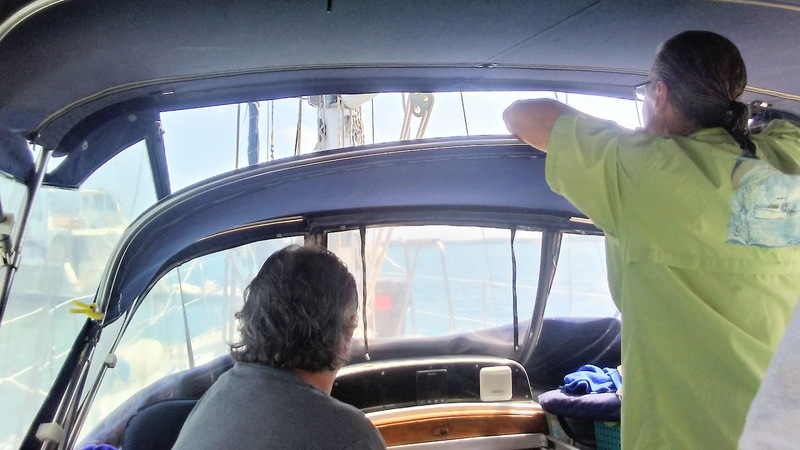 We do know that a 3-day passage to Mexico is not preferred by us on our Catalina 30. 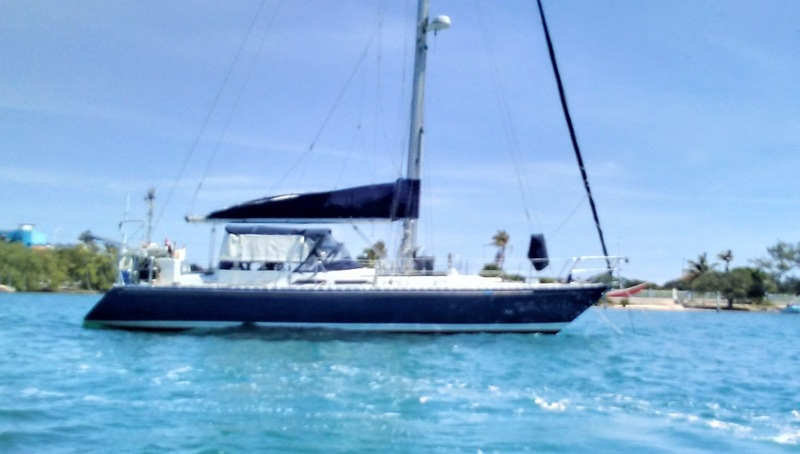 Charlie's Hylas 47 handled the waves perfectly, but on our boat that last day & night .. we don't wanna find out. Our boat is a coastal cruiser, not a bluewater boat! We plan on sailing to Isla ourselves on Nirvana someday, but with stops from Key West to the Dry Tortugas, then Cuba, then Mexico. With these stops, we can watch and wait for the right weather window for our boat .. and visit some beautiful places in the meantime. Next up .. exploring Isla Mujeres and meeting several other cruisers. Yes, the cruising community is awesome! Bahaha French here. Pictures look great. Wish we were there !!! 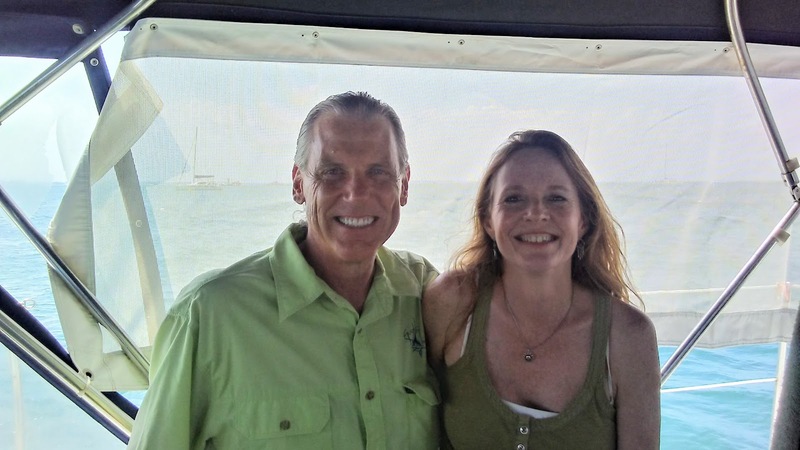 Congrats, Ken and Cheryl on your 3-day sail to Mexico! You did it on a beautiful boat, one that I would love to own if I were a full time cruiser. The Hylas 47 is a beautiful sailing yacht and one of the few really pleasing center cockpit designs (I'd include the Peterson 44 and 46 and the identical Fomosa designs in that category) with outstanding sailing characteristics. I still look forward to you taking the jump into cruising with your Nirvana! Great post. Baha French .. thanks! We wish we were there (again) too! LOL! Neophyte .. we agree! The Hylas was a great boat for our first passage .. really nice sail! We can't wait to start cruising on Nirvana after this hurricane season. Only a few more months!